Greetings from Munich in Bavaria, where the weather yesterday was not as good as in England, but the mood amongst both German and England football followers is pretty good! I’m here at the Sheraton Arabellapark Hotel for the Jaggaer Rev conference, “our official launch of the JAGGAER brand in Europe”. There are around 200 delegates here, and the software firm’s event was sold out. It’s a very pleasant conference venue; the hotel is somewhat brutalist in its architecture, in the midst of a modern area with shops, offices, restaurants and housing, but with lots of greenery around the pedestrian areas and parks very close at hand. This is the firm’s first big event in Europe since the acquisition of BravoSolution a few months back. Pool4Tool was also acquired in early 2017, and as a firm based in Germany, their clients must represent a fair proportion of the delegates here. There are a handful of UK clients here, no-one I spotted from the Nordics, but a good representation from the rest of Europe and the Middle East. Yesterday was a half day, starting at lunchtime with the CEO Rob Bonavito. He’s somewhat lower-key than some of our industry’s CEOs, and he touched on the Jaggaer name – “to hunt” in German apparently, although being able to claim the url is a bigger factor when it comes to finding a new company name, he admitted! The acquisitions have brought in two world-class platforms and Jaggaer Advantage and Jaggaer Direct (based respectively on the previous BravoSolution and Pool4Tool products) are both part of the strategic vision. Also, the firm now has a much-expanded global footprint; it is in 40 countries, has 1100 employees, 1900 customers and 60% of the business is in Europe. The vision is “100% customer satisfaction” and to create the world’s largest spend management company. We’ll have more in another article on the future roadmap in terms of the different products within the portfolio, but Bonavito handed over to Dr. Klaus Staubitzer, Chief Procurement Officer, Siemens AG. He talked about the need for procurement to demonstrate a return to the organisation, and about what we really need to do if we want to digitise our processes. We have to “think brutally hard, and act smart”. Don’t digitise lousy processes and make sure you take people with you. Digitisation should make life easier for strategic buyers; if they don’t believe that, you will get great resistance. Isabelle Carradine, Head of PwC France’s Consulting Practice, gave a wide-ranging presentation covering the way procurement’s role is changing, the external factors affecting the business landscape, and digitisation of procurement. The 2017 PwC Digital Procurement Survey shows that CPOs will accelerate their digital journey, mainly on strategic activities, but only 16% of respondents had “a clear vision and roadmap to digitise procurement”. However, the focus is now shifting from digitisation of the transactional activities – which is reasonably well advanced – to strategic procurement, and 60% of respondents said they plan to build a digital vision for their strategic processes. If many CPOs are struggling to develop a clear roadmap, they should talk to Thomas Dieringer, Managing Director Jaggaer Austria. 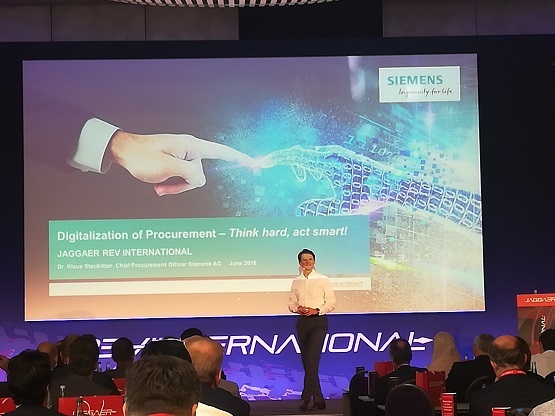 The two keynotes from Jaggaer execs are both worth coming back to in more detail, and Dieringer had some of the best content we’ve seen in terms of tangible and meaningful advice about procurement digitisation. The session from Jaggaer’s CTO, Zia Zahiri, was also full of content – although he looked at the firm’s vision and technology roadmap, his comments ranged much more widely than that and he was excellent. It’s worth saying in overview that the Jaggaer product strategy is coherent, and integration work in terms of the firm’s technology is impressive and a lot seems to have been achieved quickly since the BravoSolution acquisition in particular. As we say, we’ll come back to that and a number of other points in more detail, but yesterday gave us a lot of very good content, not too much obvious “selling” and a pleasant location – all in all, a successful first day.